i found the first third a bit tedious and heavy on the politics, but overall it was surprisingly insightful and gave me a profound sense of clarity. i'm used to reading about globalization on THAT scale but reading (what seem like commendable, however probably impossible) recommendations from an individual, albeit a politician rather than an economist, made the concept easier to grasp. It's fashionable to trash Gordon Brown: he was only PM for three years and it coincided with the financial crisis. So it's easy for his political enemies on the right to use the line of attack "things went wrong on Brown's watch therefore he is responsible". And unfortunately because of how he behaved towards Tony Blair and the Blairites in his own party, he has enough enemies from his own side that it seems there are few that rush to defend him or his legacy.However this is an excellent book that reveals a thoughtful and intelligent political leader who had a grasp on the vulnerablities in the global financial system well before 2007: in a poignant appendix to the book he includes his 1998 speech to Harvard University laying out his blueprint for global co-operation to set up international institutions that would regulate, monitor and have in place the means to take rapid action to avoid financial crises (this was in the wake of the 1997 Asian crisis). Had those institutions properly been set up the way Brown suggested we would not have got in the problems we did, but I suspect his voice was a lone one - and he was only a Chancellor, not a world leader at the time.The first part of the book is Brown's memoir of how the financial crisis developed: you can read the narrative of this in loads of different books but seeing a first hand perspective from world leader at the heart of the unfolding chaos is interesting, particularly as he was the one leading the drive for international action to put things right.The rest of the book discusses Brown's view for how the global economy should recover from the financial crisis and work together to promote growth: he considers the American, European, African and Asian perspectives and his different suggestions for policy reform in each place. His general theme is that globalisation can only work if there is global co-ordinated action between governments to make it work: if you simply leave things to the market you will get what happened last time - a small privileged elite accumulating huge wealth at the cost of destabilising the entire financial system, then fighting hard to preserve the status quo by arguing governments should stay out because markets were more efficient, then when things went wrong, looks on governments (ie taxpayers) to bail them out and then rather than accepting their share of blame and looking to create a more stable financial system going forward, they became even more vocal in defending their privileges and sought to promote an alternative narrative, ie the problem is government and welfare so the solution should be cuts on healthcare, pensions, welfare etc. Obviously it suits this narrative to silence people like Brown who are looking to actually solve the problem, so it suits them to say Brown caused it by spending too much on health, pensions, welfare.An interesting and thought-provoking book and hopefully one that will kickstart a new interest in "global growth" economics. It would make a a great political speech.JDN 2456476 EDT 11:24.A review of Beyond the Crash by Gordon BrownAs a political speech, Beyond the Crash would be like Bill Clinton's lecture at the Democratic National Convention: Long, wonky, full of numbers, but ultimately brilliant. As a book, on the other hand, it has some serious flaws.First is length, and with it, redundancy: Brown keeps saying the same things multiple times in slightly different ways, and you find yourself shaking your head and saying, "Okay, I get it: A global plan for trade growth." Most of his ideas are actually pretty good; you just get tired of hearing them over and over again.Second, Gordon Brown is a politician, and it shows: He's never willing to say anything bad about anyone, even the national governments and corporations responsible for the crash in the first place. He never outright disagrees with any ideas, merely saying, "Yes, but we should also…" even to things that you'd think the Labour Party (you're supposed to be the left wing, guys!) would find abhorrent. The result is a lot of mealy-mouthed statements that are almost meaningless, what Less Wrong calls "applause lights" that nobody would disagree with.Indeed, it seems like the Labour Party, if Gordon Brown is representative, has now become a center-right party. There is no Left in the US or the UK; there is a center-right (Democrats, Labour) and a far right (Republican, Tory). The UK also has a mainline right (Liberal Democrats), which in the US is taken up by RINOs and DINOs. There is one thing that makes Beyond the Crash worth reading, and that is the final chapter: "Markets Need Morals." This is exactly right, and exactly what we need to be talking about. Markets do not exist without human action; they are not a law of nature. Together, we decide what goes on in markets. We decide what is considered "fair business practice", what is ethical, what is legal. We must cease talk of "deregulation", and instead talk about what sort of regulation we want. Without rules, you can't have a market; you just have chaos. So there will be regulation; the question is, how will it work, how will it be enforced, who will benefit from it? Rather than writing the typical political memoir, Gordon Brown has opted to record how his office approached the 2007 world financial meltdown. There are moments where he accepts blame and credit as he worked with world leaders to contain the damage wrought by a financial system that went into free fall. Overall, Brown believes that he did thwart a lot of the contagion from destroying the UK economy compared to how the rest of Europe has fared. That said, this book is more than just a reflection of the crisis. Brown has taken a hard look at the major players in world finance and the roles that they should play in the future. The US, China, Europe, BRICs, Europe, and Africa are all feeling the growing pains brought upon by globalization. Brown feels that governments need to work together to maximize their potential, otherwise countries may seek the failures of isolation that were so prevalent during the Great Depression. Also, Brown strongly argues that morality must be brought back in the focus of finance and globalization. Truth be told, I have never been a fan of Brown's public figure. Therefore, I was quite surprised that I enjoyed this memoir as much as I did. His idealism is hard to criticize and I found myself nodding along with him more often than not. Yet, it is the implementation of his beliefs that will prove more difficult. 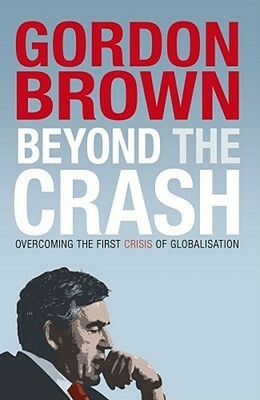 Brown is a follower of Keynes and believer of strong government interaction with the economy. It goes without saying that governments don't always have the strongest track record of working together when times are tough. All in all, a very worthwhile read (in spite of it's New Labour origins). Gordon provides a good behind the scenes view of the crisis and a fair summary of where we are now. My major issue is that his vision of adding morality back into financial markets is commendable, but hardly something that is measurable or attainable. This one surprised me. Brown is articulate, passionate and actually understandable. He says the 2008 collapse was felt around the world and reflected a failure of almost every nation to adapt to the realities of the global economy. No one can go it alone anymore. All parts of the world have to be economically viable and growing in order for all to gain. This includes Africa. Brown is far more optimistic about Africa than most people I meet. He got run out of office as British PM probably because he lacked political charm. Unfortunately, he was one of the rare leaders who was really competent when it came to financial affairs. Passionate, magisterial and with clarity of vision. Read the former Premierminister's book to get a sense of the origins. nature and way out of the recent financial crisis. With the strong emphasis on numbers, seemingly unfailing respect for all world government leaders, scorn for greedy bank executives and unflinching genuflection at the altar of growth, it could perhaps be tempered by a more reflection on how population growth and depletion of resources plus lack of vision, intellectual strength / shortsightedness also are crucial factors to consider. Brown talks about the crash, all the great meetings he had with world leaders once it happened in efforts to solve it and also comments on world economies. Everyone brown met or interacts with is, in brown's opinion, brilliant as are all of brown's speeches. The book is thus quite dull. None of the crisis was the politicians' fault, it was all the bankers - actually, the bankers werent that bad either - it was no one's fault. Brown doesnt really have a bad word to say about any one, he's mr nice or rather mr dull. Very interesting account of the Crisis and related issues, such as debt cancellation, from someone at the eye of the storm. By and large he's right but his prose lacks clarity. Ironically, this would have been a better book had it had a ghost writer but it seems Brown's own work. As someone pro-Brown, I found this an unfortunate fact to accept. Sometimes, however, the stylistic soup is worsened by syrup. Obviously aware of his public reputation, Brown seems to have overcompensated by thanking anyone he can, being polite even about President Bush and toning-down the numbers. This is a visionary manifesto which successfully argues that globalisation is not something that can be shut out by nations but is something that should be tackled through a sustained globalised effort. Unilateral national interests are not sufficient to deal with the challenges of globalisation and the advantages and disadvantages (e.g. global financial crisis) which it presents to the world community. This book is an absolute must read. It was interesting to read a take on the financial crisis from someone who was so closely tied to it, but I found the writing here to be quite dry and slightly lacking in a strong narrative. It does feel somewhat like a book that was put out in a bit of a rush, which would appear to be the case. GB was a bit hasty in getting this out so it lacks the polish of his rival(s). Some good ideas but the prose is somewhat stilted (at least we know he wrote it himself, no ghostwriter would ever sound like this!). Interesting, if only because it shows how flawed, and at times delusional, poor Gordon really is. Even as hes writing about the fallout from globalization hes so positive about Americas prospects going forward. It's simultaneously bizarre and endearing. First hand account of the initial crisis is really interesting but economic predictions and hopes a little dates three years down the track. Gordon Brown - Librarian Note: There is more than one author in the GoodReads database with this name. See this thread for more information.